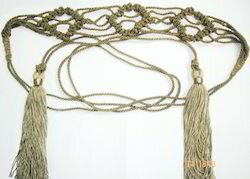 Our range of products include fashion belt decorative tassels, fashion belt and tassel fringe. Size 2cms. Wide, 84cms. Length & Loop 30cms. 1)Size 2cms. Wide, 84cms. Length & Loop 30cms. 3)Material - Plastic Bead & Pu. Size 1.75" Wide, 33.5" Length & Buckle Wide 2", Length 3"
Size Could Be Done As Per Customer's Request. Variant Colour, Size And Design. *Size:Fringe of 2.25" Width & 1" Distance Between Strands. *To decorate curtain,cushion,Ladies apparels,Fancy Dresses,etc. 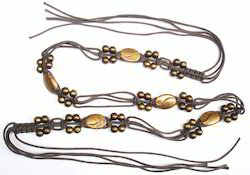 *Our fashion shiny beaded belts have various size and material for selection. *Ladies' fashion belt with lace on belt . *Fashion Belt in many and any size as per buyers requirements in any color combination.